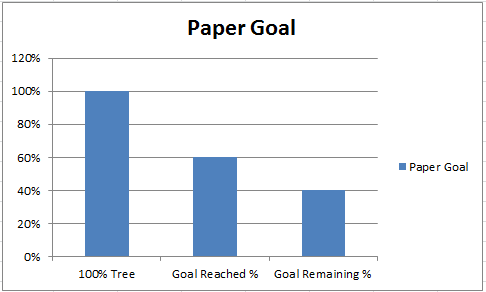 When you reach 100% of the goal, the entire tree is visible. This chart will have 3 data series. One that will be used for the tree image, one that will be used to mask the tree (Goal Remaining % series) and one that will be used to show the tree (Goal Reached % series). 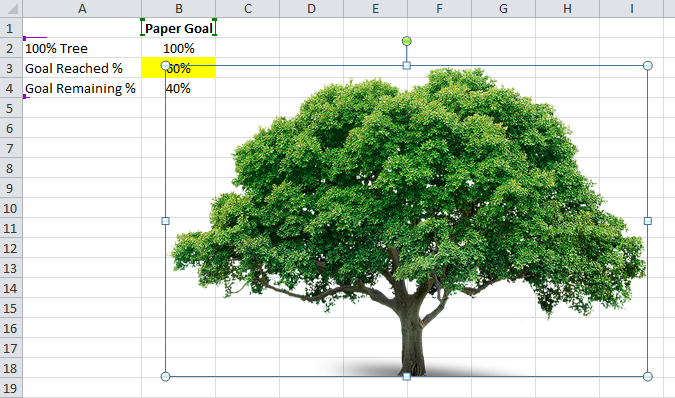 Cell B2 will only have a static value of 100% as it represents the value for our tree image. Cell B3 is a user entered value. It will be a value between 0% and 100%. 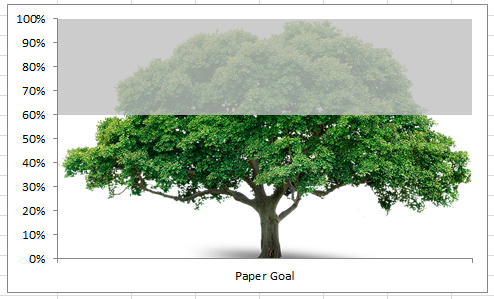 This will be used to mask or hide the upper portion of the tree image for the amount below our goal. Cell B4 has our formula of =IF(B2-B3>=0,B2-B3,0%). This formula limits the value to 0 in case a user goes above 100%. This will be used for the series that will show us the part of the tree that represents our current level toward the overall goal. Now that we have our formulas for our chart series, we can create the chart. Do that by highlighting cells A1:B4 and then select the Insert Ribbon and choose the 2-D Stacked Clustered chart type from the Columns button. This is a good time to copy and paste the tree image into the chart. 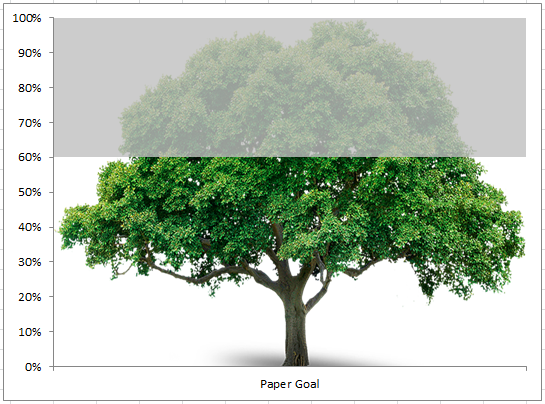 To do this, you first need to insert an image of a tree from the Insert Ribbon or copy/paste an image from a clip art. You should consider getting an image that has a transparent or white background if possible. Then Crop the image from the Picture Tools>Format Ribbon to make sure the tree image you have is close to the bottom so that it matches up with the bottom of the chart axis. This is explained further in the video, so you should check it out. Then press CTRL+V to paste the image into that data point. If you don’t want the horizontal gridlines, now would be a good time to get rid of them. Select the chart, then select the horizontal gridlines and press your delete key. 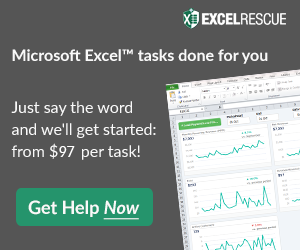 Excel makes a choice on how to show your data based on the data. In our case, it guessed wrong so we need to switch the rows/columns of our chart. To fix it, select your chart, then go to the Design Ribbon and choose the Switch Row/Column button. 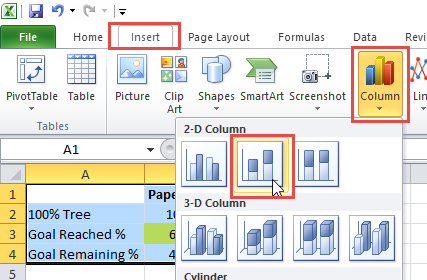 You can learn more about this from this post:Why Does Excel Switch Rows/Columns in My Chart? For this trick to work, we need to cover over the tree series with the other two series. 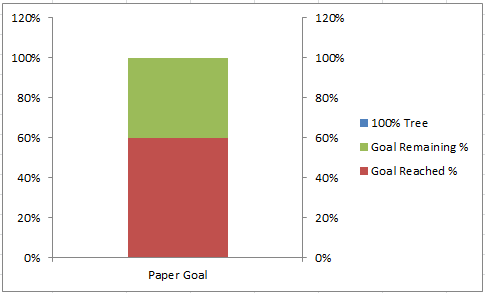 And for that to happen, we need to move the Goal Remaining % and Goal Reached % chart series to the secondary axis. To do this, select either one of those series and press CTRL+1 and them move it to the secondary axis from the Format Series dialog box options. To repeat it for the other series, it may be easier to increase the gap width of the series just moved to the 2nd axis so that you can see the remaining series that you need move to the secondary axis. 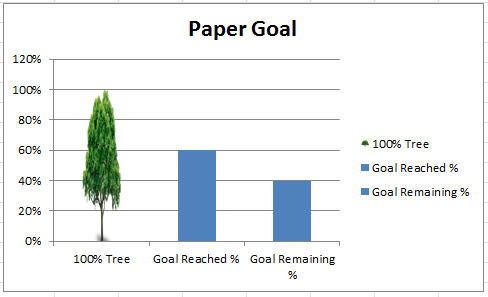 Make sure you leave the 100% Tree data series (the one with the tree image) on the Primary Axis. To make our chart look better, we should adjust the vertical axes. First, lets delete the secondary vertical axis. 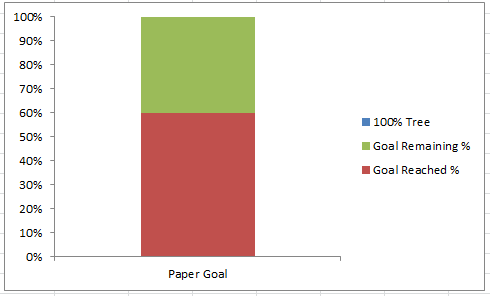 Do that by selecting the chart, then select the secondary vertical axis. Next press the delete key. The tree image I chose was rather wide, so it is best if the Chart Series has No Gap. 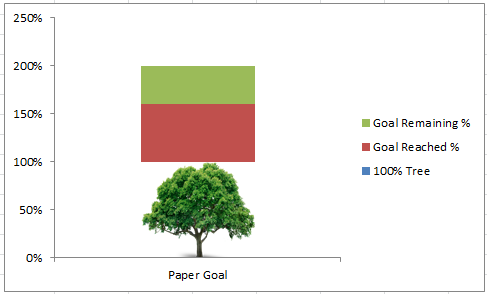 To do this, select the Goal Reached % chart column and press CRTL+1 and increase the gap so that you can see the 100% Tree chart series (as we did in a previous step). 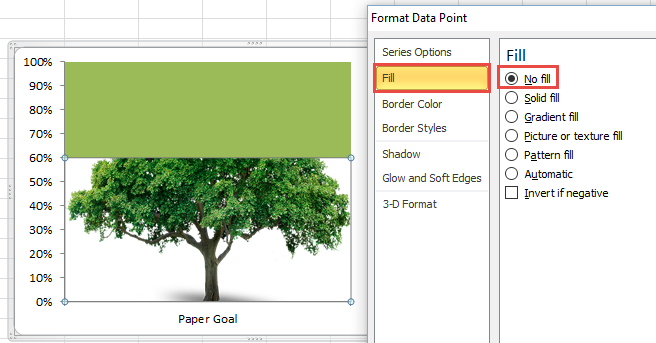 After you can see it, select the 100% Tree series and press CTRL+1 to bring up the Format Data Series dialog box. The final major step is to change the Series Fill settings so that we can see the tree on the bottom as the goal is reached and see a shadow of the tree to see how close we are to the 100% goal. 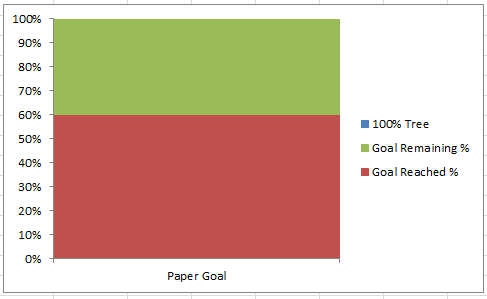 To do this, first select the Goal Reached % series on the bottom. Then press CTRL+1 to bring up the Format Data Series Dialog box. Then go to the Fill options and select No Fill. Finally, as we have a few series that don’t make sense you may want to delete the 100% Tree legend entry or just delete the entire legend. To do this, select the chart, then select the Legend and press your delete key. Let me know how you could use this technique in your Excel Dashboards in the comments below. This is a brilliant post! Thanks for the great work! Thanks so much Libby! Much appreciated.